Paxton (population 4,525) is located in east central Illinois in Ford County, about 25 miles west of the Illinois-Indiana border. The community serves as the county seat, and was founded around 1860 as Prairie City. The name later changed to Prospect City and then Paxton in honor of Sir Joseph Paxton, an Englishman who had designs of creating an English settlement in America. The plan failed, but the townspeople retained Paxton's name as its own. In addition to the Illinois Central Railroad passing thru the center of the town, commerce also arrives via Interstate 57, US 45, and Illinois Route 9. Paxton is 25 miles north of Champaign-Urbana, and 50 miles east of Bloomington. The history of education in Paxton goes back to 1856 when the first building was erected. Education was taken seriously in the community as Augustana College moved from Chicago to Paxton in 1863. then later relocated to Rock Island in 1875 where it remains today. The first high school courses were taught in 1872, thanks in part to aid the efforts to establish and fund Rice Collegiate Institute, which added to the educational and cultural advantages of the community. 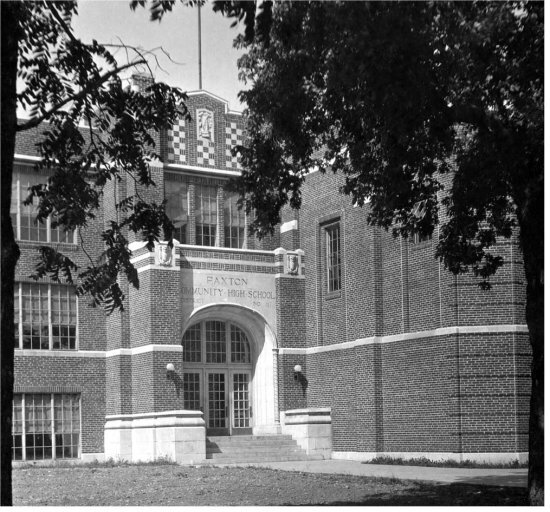 The history of high school buildings includes that the picture you see at the top of this page was opened for PHS students in 1925 and used until 1965 when a new building was erected. 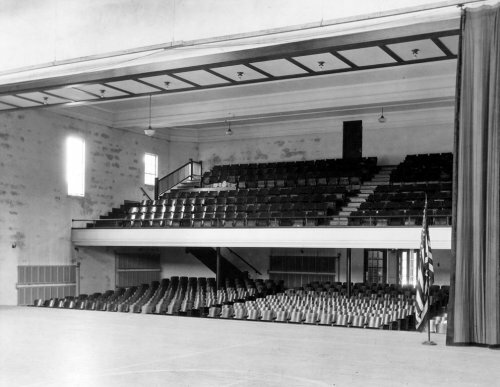 Stephen Larson tells us that the above Paxton High School building was designed by Urbana architect Joseph Royer. 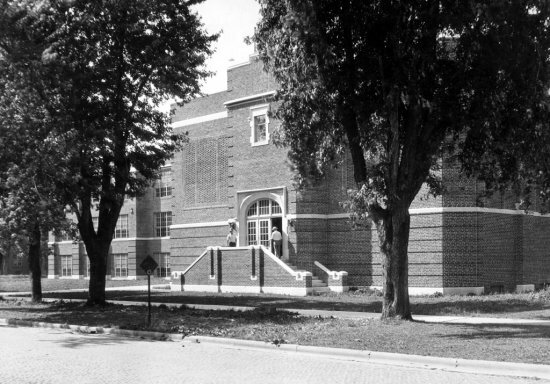 Photographs of his high schools are on file at the Champaign County Archives. 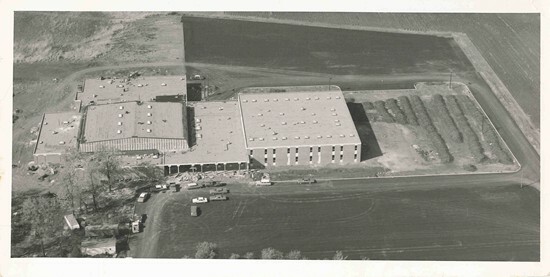 When the high schoolers moved into their new facility in 1965, the old building became the home of Paxton Junior High students until 2005 when they moved into a new facility. The 1925 building remains important to the Paxton community today, still being used as Eastlawn Grade School. 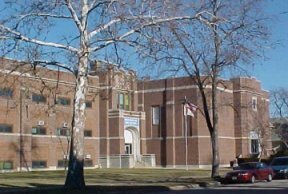 Paxton operated its own high school successfully for over a century until the late 1980's when discussions began with neighboring Buckley-Loda High School for a possible consolidation. The voters in both school districts agreed to merge their schools and it became a reality in the fall of 1990, renaming itself Paxton-Buckley-Loda (PBL) High School and setting up shop in the 1965 building at Paxton. You can read more about Buckley-Loda and their separate high schools on this site. Paxton High School - Rah, Rah, Rah! The Mustangs were competitive in several sports, among them football, boys' and girls' basketball, volleyball, baseball, cross-country, track, and even wrestling. Also, Paxton had success in speech team competition, according to the IHSA website (www.ihsa.org). We believe that Paxton could have offered other activities, but there is no known information available. If you know, please contact us at the addresses listed at the bottom of this page. 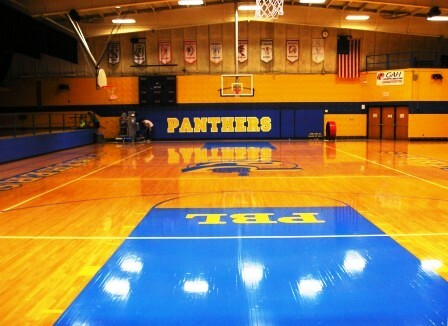 PHS was a member of the Wauseca Conference along with archrival Gibson City, Danville Schlarman, Watseka, Clifton Central, Hoopeston-East Lynn, Georgetown, and Prairie Central before the league folded in 1990. For more information about the Wauseca, click here on "THE GREAT CONFERENCES" for details. The Mustangs were successful on the gridiron, dating back to 1909 when the earliest known team in school history went 5-2. Two other teams went unbeaten, while several others lost just one game. Paxton even made their mark in the state football playoffs, earning four trips to the postseason and placing second in the 2A finals in 1984. "I thought you might like the (1958 Football Schedule), for what it's worth. I can attest that our record that year was all losses and one tie (Farmer City)." 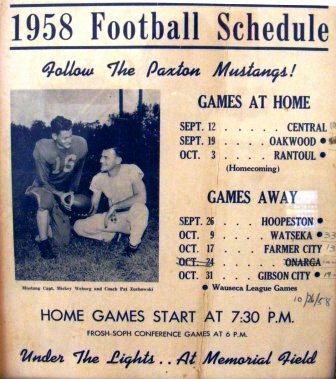 "Norm Henderson and Jerry Zimmerman served together as head coach and assistant coach for the Paxton High School football program for thirteen years, from 1966 -1978. During this time period they posted winning seasons in 12 of their 13 years coaching together and won 3 Wauseca Football Championships in 1968, 1972, and 1978. This was probably the longest successful run for two football coaches in the school's history. Both of these fine men are deceased , but their memory lives on in the many young men who played for them during this time span. They both dedicated their lives to developing student /athletes and instilling valuable lifetime values in their players." Dennis Polson & Steven Nuss. Once football concluded its season, the Mustangs were also competitive on the hardwood, winning two district titles to go along with nine regionals. All of these were won under the one-class system, with six plaques being awarded in consecutive years. We are looking for win-loss records along the names of head coaches from these teams, so if you know anything, please let us know at the addresses listed at the bottom of this page. Paxton was fortunate to have three teams finish in the top ten of the team standings at the state track meet, and several Paxton athletes came home with victories in the finals. Under the supervision of Fred Guyot, Paxton became a contender for a state title in cross-country. 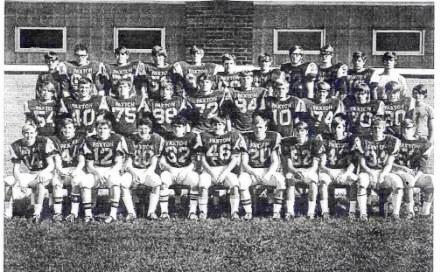 The Mustangs had a fourth-place finish as a team in 1980, and had two individuals place in the top 25 for all-state honors at the state finals. Although details are few, there was only one grappler in school history that placed at the state finals. William Vest has the distinction of being the Mustang to do so, taking fourth place at 112 pounds in 1953. We are curious to find out more about the Paxton wrestling program and some of its successful matmen. It is the belief of this writer that Paxton did offer baseball, and may have been competitive in the sport, even though there are no records of a baseball team at PHS. Again, we want to hear from you if you have information about the Paxton baseball program. In the early days of the IHSA state tournament, the Lady Mustangs qualified for state twice, led by star player Angie Lee (who would go on to play and coach at the University of Iowa), along with Shalynn Darr and Sandy Burkland. Paxton also won three regionals to go along with previous hardware captured by the two state qualifiers. The Lady Mustangs offered excitement in the gym with its volleyball program, winning five districts, a regional, a sectional and qualifying for the state finals in a six-year period. Just like the boys' team, the Lady Mustangs had a couple of members go to the state meet and place high enough to earn a medal in the discus. The Paxton speech team was competitive in IHSA state finals competition, bringing home a total of five top-five finishes individually, and some team trophies to boot along with a ninth-place finish at the state meet in 1975. 1962 Tim Smith Radio speaking---2nd Pl. 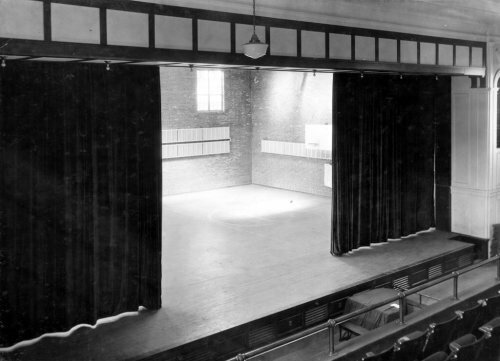 1966 Douglas Smith Original oratory---4th Pl. 1973 Linda Massey Original Comedy---5th Pl. Cindy Eppelheimer - Dramatic Interpret.-STATE CHAMPION! WELL DONE, MUSTANG SPEECH TEAM MEMBERS!!! "First - thanks for putting this site together! Nice trip down memory lane! Mr. Shields was principal, and after his retirement, Mr. Larry Eggleston was appointed. During the late 1960's we also had a very successful FFA Chapter (Future Farmers of America) under the leadership of teacher Bob Rohlfing. This group continually won state awards as a group and individually. Also our golf team, under the coaching of Norm Henderson, always finished near the top of the Wauseca Conference. Senior player Eric Baquero went to state in 1970." This is what I remember from the 1975-73 junior high. 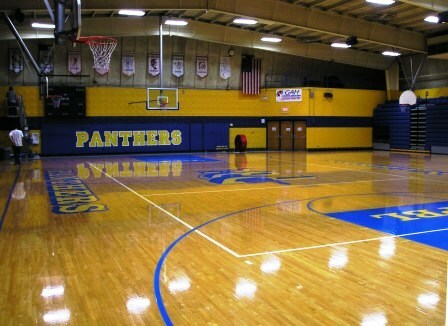 This was when Pat Prina was a junior high PE teacher and basketball coach." still am grateful. And I'm still a good typist!" 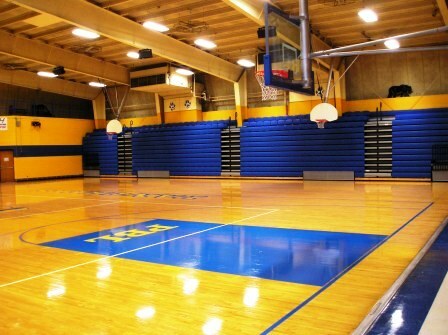 "Paxton constructed a new high school that opened in 1965. Football games and track meets were still held at Memorial Field adjacent to Clara Peterson Grade School until the new track and football field were constructed at the new high school in the mid-1970's . There were many memorable games played at Memorial Field including a 20-14 win over arch rival Rantoul in 1972. Paxton overcame a 14pt deficit to defeat Rantoul who had a school enrollment of 1500 compared to an enrollment of 575 for Paxton ." ...about Paxton High School and its' history. If you have more information about extra-curricular activities, such as coaches' names and win-loss records, comments, words to the school fight song, or anything else, let us know. You can email us at ihsgdwebsite@comcast.net. or by sending your information thru the USPS to the address listed below. Pictures are also welcome, too.